Alvin “Creepy” Karpis was born August 10, 1907, in Montreal, Canada. When he was young his family moved to Wichita, Kansas, where Karpis first engaged in illegal activity. When Karpis was 10 he was already involved with bootleggers, gamblers, and pimps, and in 1926 was arrested for attempted burglary and sentenced to 10 years at the State Industrial Reformatory in Hutchinson, Kansas. 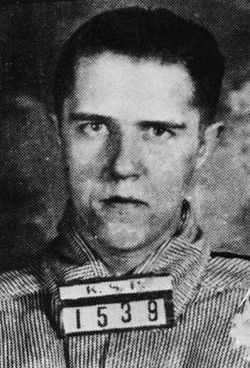 Karpis escaped the reformatory with another inmate, Lawrence De Vol, but was caught stealing a car in Kansas City, Missouri, a year later. Karpis was transferred to the Kansas State Penitentiary in Lansing, Kansas, where he met Fred Barker, a member of the infamous “Bloody Barkers,” who was doing time for a bank robbery. Karpis was released in 1931 and he reunited with Barker and formed a gang. The Karpis-Barker gang was responsible for numerous bank robberies, hijacked mail, and kidnappings in the 1930s. Karpis quickly became the public’s number one enemy and the newly formed Federal Bureau of Investigation was using all its power to track down Karpis and his gang. Barker died in January 1935, and Karpis was almost killed in a shoot-out soon after, but managed to escape. On May 1, 1936, Karpis was located in New Orleans, Louisiana, and arrested. Karpis was sentenced to life imprisonment at Alcatraz beginning in August 1936. However, Alcatraz closed in 1962 and Karpis was transferred to McNeil Island Penitentiary in Washington state. He was later paroled to Montreal, Canada, in 1969. A few years after his parole, Karpis moved to Spain, where he was found dead August 26, 1979. Although his death was at first ruled suicide, the judge later determined his death was from natural causes.